Scott Pellegrom has become one of the leading innovators for the next generation of drumming. Scott is a multiple-time industry award winner and a Top Four Finalist in the Guitar Center Drum-Off. 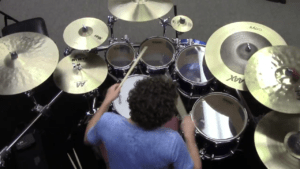 He has been nominated as the best up-and-coming player in Modern Drummer and listed as one of the top music educators in the world. In his career, Scott has educated in hundreds of clinics and assemblies and produced an album with his band, SP3.